Today we’d tried to get out to Portland and see some sights. Despite a late start, we were able to hit the World Forestry Center (which was a total disappointment) and the Rose Garden (although the roses weren’t in bloom) and the Pearl neighborhood (which was cool). 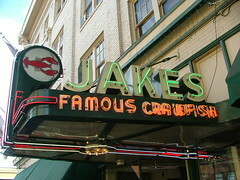 We had lunch/dinner at Jake’s Famous Crawfish. It was a great pub with excellent happy hour deals that started at 3pm.